Step one: Clean your face properly. If your face is dirty, the makeup will not stick as well, may wipe off, or smudge and your costume will not last the whole evening of trick or treating, partying, etc. So, start with a clean canvas for best results. Step two: Choose the right kind of makeup for your preference. Halloween makeup comes in a variety of types, water based, oil based, cream, powder etc. some last longer and work better than others. 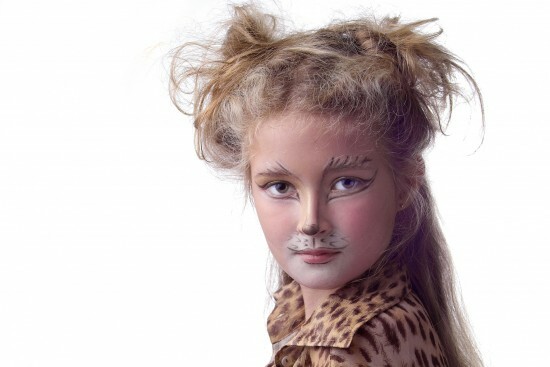 For a cat costume you will probably want a cream based makeup that is washable. This will give you better coverage, it will last longer, and be easier to remove when you are done with the costume. Step three: Apply a basecoat. Choose makeup the color you want your cat to be, and apply it all over your face, leave a small area on the nose uncovered if you are going to be using a dark base coat like black, and want your cat nose to show up. Use a sponge or a finger to evenly spread the makeup around your face for a light, but even coverage. Step four: Let dry completely. If you try to apply the next coat, or the next elements without letting the above coat dry completely, it will smear and you might have to remove everything and start again. So, be patient. Step five: Apply makeup to create a nose. Now you want to shape your cat nose. You will probably want to pick a color the opposite or that contrasts well with the color you chose for your base coat. You will want to use a makeup brush to create this nose so that you can shape it to the distinctive cat nose shape. You can then use shading and highlighting to make it appear to protrude some, as if you were an actual cat. Step six: Again, let dry completely. Step seven: Apply whiskers, either by paint, or using synthetic whiskers. The choice is yours. Paint is easier, synthetic is more realistic looking. This means that you need to determine how much work you want to put into the makeup. If you apply synthetic whiskers you will either use a facial glue of some kind, or a putty that adheres to the skin. If you do not apply them well, they may fall off before the night is over. If you paint them on, you will want to make sure they can be seen, so a black base coat may make it difficult. Step eight: Add ears, tail, and body suit to make cat makeup for Halloween more realistic. Step nine: Set makeup with a mist of water. Use a spray bottle and squirt your face with just a fine mist. Step ten: Finish setting makeup with a sprinkle of corn starch over the misted face. Now you should be able to touch your makeup without smudging it, but it will still easily wash off.